Here's one of the superb slot games online from NextGen Gaming. In ‘1001 Arabian Nights’, Aladdin rubbed a magical oil lamp to release a powerful genie who granted wishes to fulfil his heart’s desire. 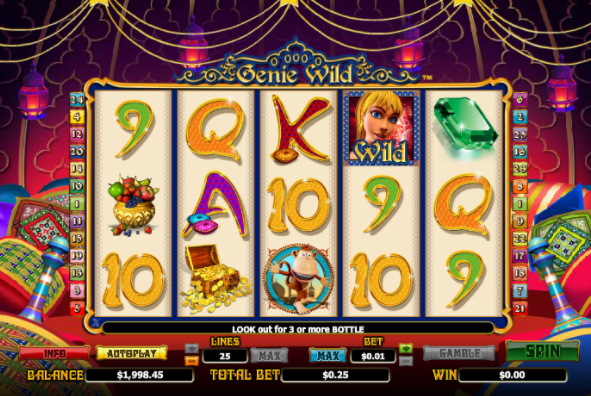 Genie Wild is a new online slots game that will surely fulfil all your desires and more. Journey to the mysterious and beautiful land of the Far East, where the smell of spices fills the air, and in any ornate bottle might lurk a genie ready to bestow unimaginable riches upon you! You’ll meet the Genie of the title, a blonde, blue-eyed young girl who resembles the title character in the 1960s sitcom ‘I Dream of Jeannie’, and spin the reels for a chance to share in some of her riches. Make sure to visit promo page to take advantage of UK casino bonuses! Strong, well-realised themes, as well as detailed and beautiful artwork, make their games an immersive delight for both the casual and the more serious slots player. You’ll know you’re playing a NextGen game from the stunning, high-res graphics, slick finish. Another top selling point is their inventive and refreshing slots bonus content, that sets their games apart from the crowd. SCATTERS – if three or more bottle SCATTER symbols appear, this triggers 10 Free Spins. 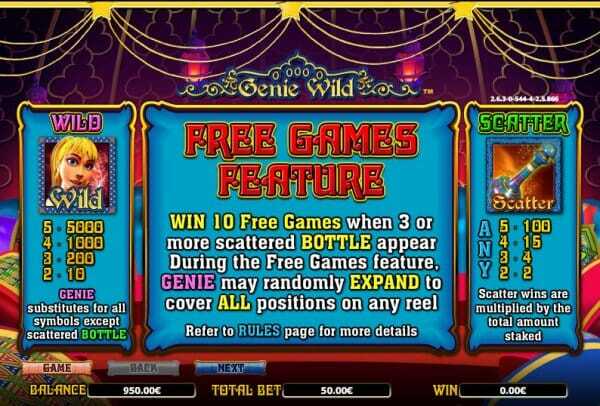 GENIE WILDS – during Free Spins, there’s a chance that Expanded Wild Genie symbols will appear, offering big winning opportunities. Collecting symbols, too, pays off in a big way. 3-5 matching symbols over the reels, and the Genie will reward you with anywhere between 5 and 200 times your stake. Some symbols are clearly extra beloved to the Genie, and she’ll grant you up to 500 times your stake for finding multiple fruit bowls, up to 750 times your stake for 5 treasure chests, and 1,500 your stake for finding 5 of her little friend the Monkey! This game is as rich, attractive, and full of treasures as a Far Eastern bazaar. The task of finding multiple symbols for big wins, alongside the smaller glittering jewels of win-lines, makes the game varied and exciting. You’re sure to want to polish the bottle to release this Genie over and over again! If you enjoyed Genie Wild then you might also like Mona Lisa Jewels.